Custom curves can be used by inputs and mixes. There can be up to 16 custom curves. Each curve can have 2 to 17 points. Default Name: CV1 – The name as it appears in the list of curve sources when the custom name is not configured.. Custom Name: Lnr – The name as it appears in the list of curve sources when it is configured. The name appears in the custom curve list when selecting them from inputs or mixes. The points’ positions on the horizontal axis can be automatically determined and stay fixed. If 2 points are specified the they will be a -100 and +100, if 3 then -100, 0 and 100. The vertical position is configurable. The point’s position on the horizontal and vertical axis can be specified. Two points may occupy the same position to help make a step curve. Between points the firmware calculate a curve instead of using straight lines. Scroll past “Smooth” and the points editor appears. The point being edited in shown on the graph as a square. Companion has a powerful custom curve editor. 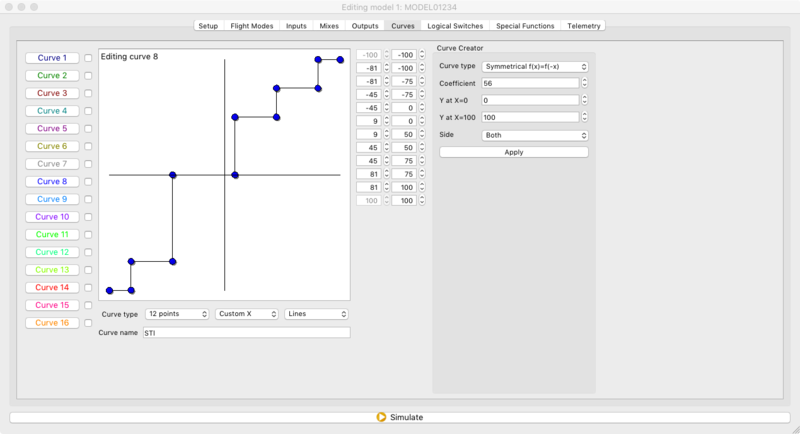 Some of the features are the ability to view multiple curves at the same time, dragging the points to the desired position and using a curve generator.